Etiology: Myxoma virus is a DNA pox virus and a member of the leporipoxvirus group. Myxomatosis is caused by any one of several strains of myxoma virus. Myxoma virus is antigenically and genetically related to rabbit fibroma virus. Incidence: Incidence is rare in laboratory rabbits. Transmission: The principal mode of transmission is via arthropod vectors (mosquitoes, fleas, flies, and gnats). Transmission may also occur by contact with secretions of infected rabbits. Virus-infected skin nodules on wild rabbits (Sylvilagus sp. ), are reservoirs of the agent. Clinical Signs: In domestic rabbits, the clinical disease picture is largely predicated by the strain of virus involved as well as genetic resistance of the breed of rabbit. Virulence of the different strains ranges from a mortality incidence of 99% in European rabbits to less than 30%. 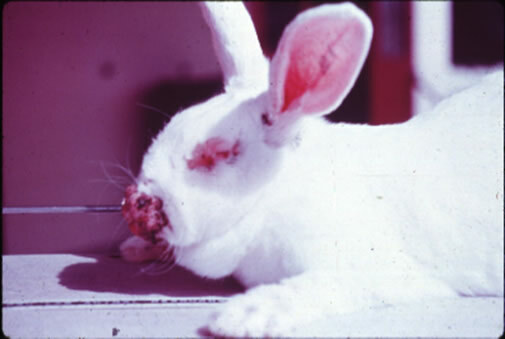 California Strain of Virus: In the peracute form, rabbits die within a week of exposure showing erythema of the eyelids. With the acute form in which rabbits survive for 1 to 2 weeks, symptoms are fever, edema and erythema of the eyelids within 1 week post-inoculation; and erythema and edema of anogenital orifices and nares by day 9 to 10 post-inoculation. If the rabbit survives beyond day 10, it may have purulent conjunctivitis and edema at the base of the ear. Cutaneous lesions predominate. Pathology: The most prominent gross lesions are skin tumors and pronounced cutaneous and subcutaneous edema. 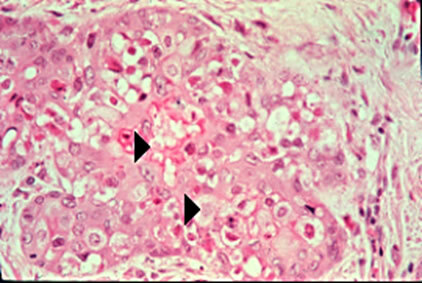 There is epidermal hyperplasia with intracytoplasmic eosinophilic inclusions in basal cells. Epidermal degeneration with intense inflammatory infiltrate may be seen. The dermis is infiltrated with large stellate myxoma cells in a mucinous matrix with inflammation and neovascularization. Myxoma cells often contain intracytoplasmic eosinophilic inclusions (arrowheads). Dermal necrosis or hemorrhage from vascular compromise may be seen. Visceral lesions are occasionally observed, especially in young rabbits. There may be lymphoid depletion in the spleen and lymph nodes, hyperplasia of alveolar pneumocytes, and presence of myxoma cells. There may also be necrosis and hemorrhage in lymphoid organs, the kidney, GI tract, heart, liver, and reproductive tract. Diagnosis: A diagnosis can be made from clinical signs and histopathology, virus isolation, and PCR amplification of viral sequences from tissue specimens. Serological tests including IFA and serum neutralization using myxoma antibody may also be used.